Compost Farming Hestel Tellus: About composting grasses. How I do it. We use manure from cows or sheep as a compost starter. Each manure from a 'grass eater - vegetarian' can serve. The manure must be processed first before it can be used as a starter. To begin we add water. Then also leachate coming from the composting process. But we add that later. When we are already a bit underway in the process. What we gain then is grafting fluid. 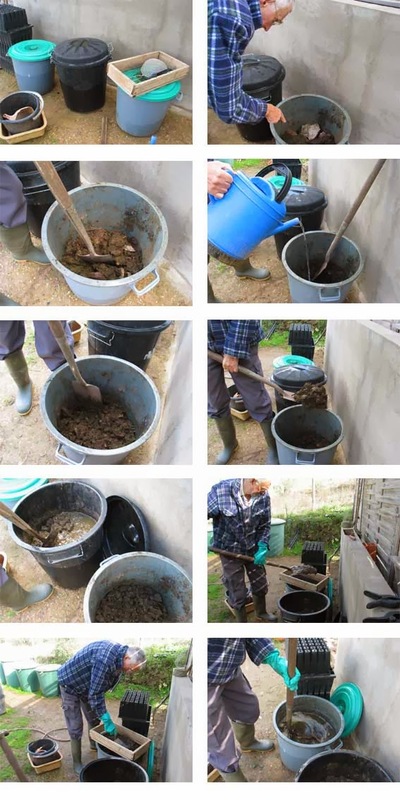 Hendrik: ''In order to allow the manure to be manageable, to make it thin, either liquid, I put it in a small container and moisten it in steps. Submerging it at once, does not work. The manure must absorb the water gradually. When it has fully engorged it falls apart. It then goes into a second container to store, to keep it wet. I then strain it, to crush it. I do that over a third container, that I use for the final grafting fluid. There is water already and also leachate later. 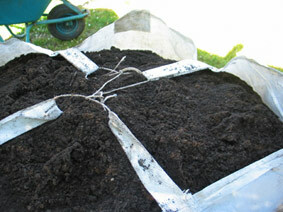 One shovel of manure is sufficient for about 4 times grafting. So I do not need much. Putting grafting fluid in the immersion barril. The grafting fluid also contains leachate. This comes from the composting process. In the beginning you have none yet, but that's okay. Later you can use it and reuse it. Hendrik: ''I like to reuse the leachate. Everything you throw away you lose. And the leachate is optimally useful. So I have already produced a home-bacterial strain. A few times I also mix in some leftover compost. That I do to stimulate bacterial life." Our water comes from a borehole. It is a bit ferruginous, which is not a problem in itself. Gloor containing water would be a bigger problem. You have to be careful. Because gloor destroys the development of bacteria. We need to add sufficient bacterial moisture to the process. For optimal heating the optimal moisture content of a mass composting material is 30%, the books say. But we experienced no problems with much more moist in the materials. Here we mean the moisture added, not the natural moisture inside the plant. We dry wet grasses (and also kitchen and garden waste) before composting. 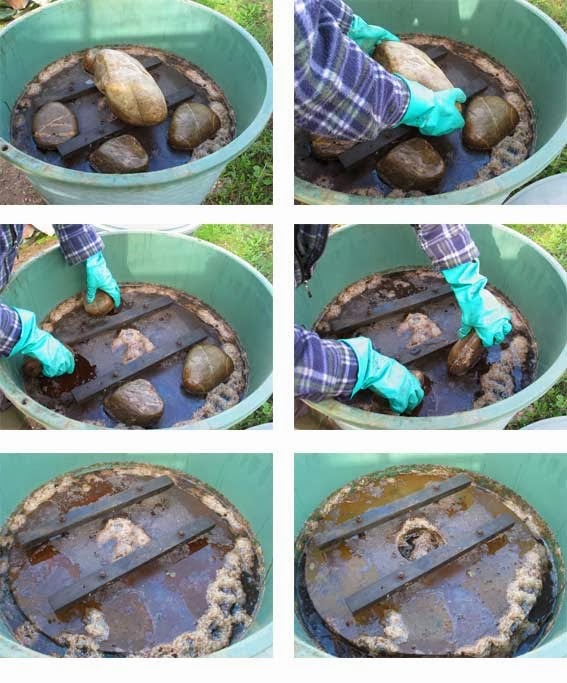 We do this because we need to have lots of good bacteria in the composting material. The moisture in the plant is this too clean, too sterile, as it were. We want to see some action ... a quick start of the heating. And that may be the best with dried materials. These are the most susceptible to external influences. Hendrik: ''I fill the immersion barrel half with grafting fluid; thus half with pretreated cow dung in water and leachate. If I run short of grafting fluid, I just ad rainwater or water from the bore hole. Here I immerse the hay, press it firmly under the level of the water and than keep it there with a heavy weight. A plant protects itself with a layer of wax. So that moisture, mold, and bacteria can not penetrate into the plant. A dry plant looses its wax easier. This is why we like to dry wet grasses before starting to compost. And we like to wait until the grasses have grown to 'hay on stem'. Here in the Alentejo this is possible. Although we have to break the harvested hay or bruise it. Because the Alentejo crop is stiff, hard and full of thorns. Hendrik: ''Because the harvested hay is so hard and full of quills I want to bruise it before I start to immerse it. I make small packets of this hay in a small container treading it round to break it. With these packages, I fill the immersion barrel. This works best. When I take the hay out off the immersion barrel, it is not dry immediately. Grafting fluid remains sticking to it. (Cleaving moisture.) So it should still drain. This takes a while. For this you cannot wait. So I arranged two barrels for this purpose. Two actually, in order to gain a bit more volume. Here I collect the grafted hay to drain. These are my 'draining barrels'. 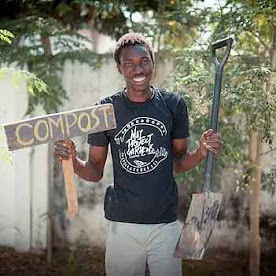 On average, we than gain nice compost in three months. Not always, because sometimes it takes longer, depending on the weather. And the weather is unpredictable. Especially in winter when there can be many nights with frost. Than you can not rely on a good heating. Even in this Alentejo climate.